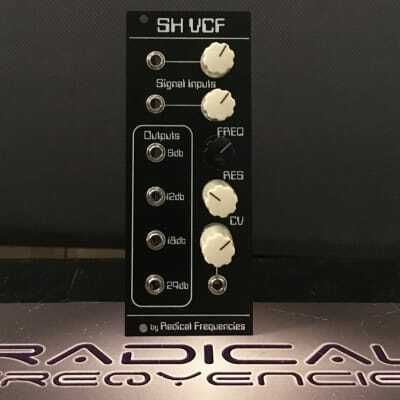 Radical Frequencies SH VCF It is a complete discrete through hole replica of the the original mono synth sh-1 filter from late 70s ! In detail it is a cascaded OTA low pass filter with four OTA-stages of the original vintage CA3080 ics with FET transistors as Buffers , it has 2 inputs with potentiometer , 1 cv input with potentiometer and 4 independent low pass outputs one for every ota stage : 6db , 12db , 18db and ofcourse 24db. The 6db and 12db outputs are in 180° phase , as result you can mix them together with 24db out in a mixer to make bandpass and hig pass combinations !